Powered by our popular Thieves essential oil blend, Thieves Household Cleaner is perfect for having on hand to keep your house clean and free from harsh chemicals. This jack-of-all-trades comes in handy no matter the task, and we’ve got three new recipes to prove it! Add all ingredients to a spray bottle and shake well to combine. To use, spray windows and glass surfaces liberally and wipe clean with a lint-free cloth. Combine Thieves Household Cleaner and enough baking soda to form a thick paste. Apply mixture with a clean cloth, sponge, or scrubbing brush and scour the surface thoroughly. Let sit for 15 minutes, and rinse everything clean. Mix water and Thieves Household Cleaner in a spray bottle, shaking to combine. To use, lightly spray the spot and blot with a clean white cloth. Repeat as needed. 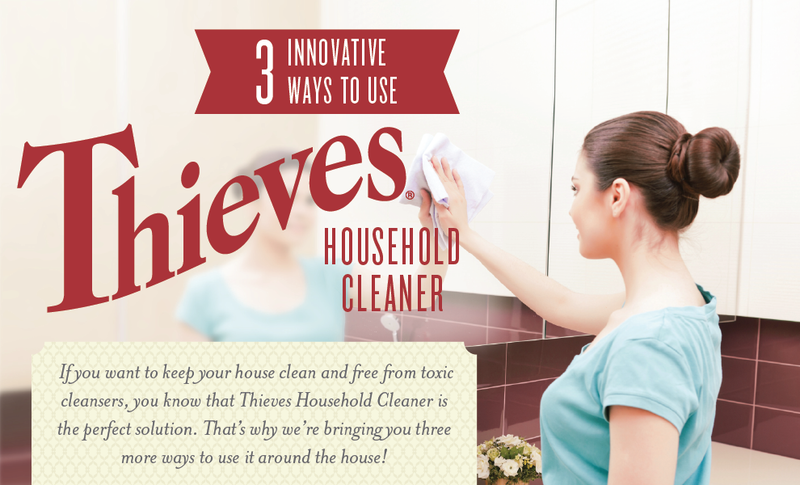 What’s your favorite way to use Thieves Household Cleaner? Let us know in the comments below! This entry was posted in DIY with Essential Oils, Personal development and tagged AT HOME, CLEANING WITH YOUNG LIVING, DIY, SHARING THE LIFESTYLE, VIDEOS, wellness, YOUNG LIVING LIFESTYLE.